KENNEDY SPACE CENTER, Fla. (NASA PR) — The Boeing Company completed its first performance milestone Aug. 23 for NASA’s Commercial Crew Integrated Capability (CCiCap) initiative, which is intended to lead to the availability of human spaceflight transportation services for government and commercial customers. In its Integrated Systems Review (ISR), Boeing presented the latest designs of its CST-100 spacecraft, United Launch Alliance’s Atlas V rocket launch system, and ground and mission operations. These designs will serve as the baseline for further development work to be accomplished during CCiCap. The company also discussed its plans for safety and mission assurance, which ultimately will contribute to achieving certification of the system for human spaceflight. Technical experts from NASA’s Commercial Crew Program (CCP) participated in the review in Houston. They are in the process of providing comments and advice based on more than 50 years of human spaceflight experience. At the review, Boeing also presented results from numerous tests that were conducted as part of its earlier Commercial Crew Development Round 2 (CCDev2) Space Act Agreement with NASA. These tests included parachute and air bag drops, abort engine firings and wind tunnel tests. Future development and certification initiatives eventually will lead to the availability of human spaceflight services for NASA to send its astronauts to the International Space Station, where critical research is taking place daily to benefit all of humanity. The overall goal of NASA’s commercial space efforts is to make low Earth orbit more accessible and open for business for other government and commercial customers. 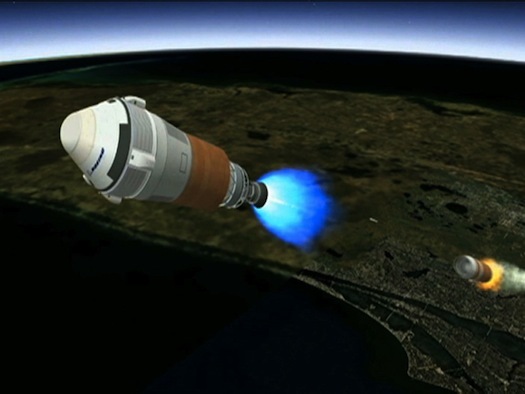 The picture shows CST-100 launching on a Delta IV.